If you’re visiting NYC, there’s a good chance you’ll find “LinkNYC” nearby. NEWS UPDATE – An article in the New York Times on September 14, 2016 reported that New York City was disabling the Internet browsing function on LinkNYC because users were creating encampments around the kiosks. As officials try to find a solution, other functions on LinkNYC will continue to operate. Travelers on the go depend on being “connected” via smartphones—whether it’s to figure out how to get from Point A to Point B on a map; to make a phone or email reservation at their next hotel; or to find a nearby café, bar or restaurant. Data usage is often so costly that turning on a smartphone when you’re away from home can be prohibitively expensive. Also, smartphone batteries drain pretty rapidly during a long day of touring, especially if you have multiple apps running in the background. 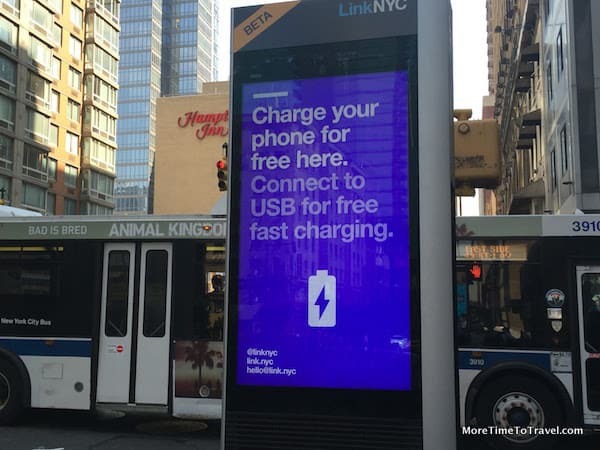 With the launch of “LinkNYC” in beta in January 2016, New York City has taken a bold step to make the city more tech-friendly for visitors as well as New Yorkers who want to stay connected. It may be hard to imagine but even in the Big Apple, approximately 1 out of 4 New Yorkers doesn’t have Internet access. The city has begun installing a new communications network with more than 180 kiosks called “Links” on street corners in Manhattan and the Bronx. The plan is to eventually expand the beta program (after getting feedback from the public) so there will be more than 7500 Links spread across all the boroughs. Think about what it was like when phone booths were ubiquitous around the city, almost on every street corner. Browse the web on the touchscreen at the Link. Use opt-in GPS location services to access Google Maps for directions. Plug in a smartphone or other electronic device to one of the two USB ports for a quick re-charge. Obtain access to city 311 services (e.g., to find out about alternate street parking rules) in addition to a big red call button for a 911 emergency. Who is paying for this massive effort to connect New Yorkers, even the disenfranchised homeless population? All of these “LinkNYC” services are 100% free to users, paid for by advertisers and private sponsors. Although the slim, contemporary design of the Links don’t take up much valuable sidewalk space, the two high-definition 55” display screens (one at each end) that can be used for public service announcements and/or advertisements. This is expected to offer a distinct advantage over telephone booth ads, which were static. Some of the “smart advertising” already in place is an affiliation with the realty company Streeteasy so that potential renters can find vacant apartments in the neighborhood close the Link advertisement. What about privacy/security? The open network relies on web-server SSL security (URLS beginning with https) for privacy. During the beta phase, an alternative private network is limited to certain Apple products (smartphones and tablets) but will be expanded to other devices as the program is rolled out. Of course there is the potential for “Link Abuse,” intentional or not. At one link in midtown, we witnessed a woman plugged in to the Link, dancing on the street as she listened to music. A Twitter user snapped a picture of another person binge-watching TV at a kiosk (below). Some news outlets report that people living near the Links have complained that audio speaker were initially set too loud. All in all, LinkNYC seem like it will be a tremendous asset to locals and visitors alike with the potential for creative uses that haven’t even been anticipated: When we visited the city on Father’s Day weekend, people were invited to send messages on the display screens by tweeting their Dad’s name to the service @LinkNYC. In the New York Times: Are the Free Kiosks on New York Streets Safe? To find a nearby link or read more about the new network, go to the LinkNYC website. Wow, very cool! Is this coming to other cities? Our local mall, Woodfield Mall, is a large regional mall. It was just remodeled and there are charging stations and USB outlets build into the seating areas. I couldn’t find a similar list of charging stations. I’ve also seen them at malls, airports, etc. However, the NYC effort is quite ambitious in scope! I knew about Skokie and Naperville. I didn’t know about Marion, which is right next door to Carbondale. We’ve stayed there when the hotels in Carbondale overflow. OK. Wow! I live in NYC and have ridden my bike by a few of these and taken a glance…. I ASSUMED that it was JUST a charging station. Who knew? Thanks for this awesome post. I love the guys sitting in their “office” chairs. As a world traveller who carries around a cumbersome better recharger, certainty the recharge option is useful. Since the project is still in Beta mode, perhaps they will need to set time limits in the future! The speed of these connections are truly amazing~ better than mine at home. Like Rebecca above, I too carry an overload of battery charges for phones, computers and cameras, so anything like this to ease the traveler’s burdon is welcome news. An informative post, Irene. Thanks. One of the most onerous parts of carrying all that gear is getting through airport security! Thanks for a very informative article about the new LinkNYC program in New York City. It will be interesting to see the results of this 180-unit test. I admit to being in the skeptical camp, but, in any case, it is definitely one more reason to love the Big Apple! I’m sure it will take time to work out the kinks and get the entire system into operation. I love this wifi for the people and visitors alike, it should be a model for all cities in the US. Unfortunately, we still run into many airports that don’t even have any or a sufficient number of charging stations—although they are becoming more plentiful. I’ll try it when we return to NY. Sounds like a good plan! Would love some feedback of your experience! Read about this a while ago but haven’t had the chance to test it out yet. Thanks for the reminder, I will next time I’m in the city. Think it is a fantastic idea, hope it catches on in many other places. Good to know. When I was there last month, I heard something about that they were installing free wifi throughout the subway. I imagine that living in the Bay area, you must be very spoiled! LinkNYC is such a great idea. And the design is unobtrusive. It will be interesting to see what other creative uses people come up with. I also love the fact that it is self-supporting through advertisements. Such a smart idea and about time! I was wondering when a 20th century version of the ‘phone booth’ would be invented. UGH! I was just in NYC a few weeks ago and wish I had known more about this. What a great idea. I probably saw these but didn’t pay attention to what they did. Wish more cities had this so I wouldn’t have to panic about running out of a battery charge or using up too much data. Thank you for sharing!! I’ve found the same problem in airports where there are many users, Karen. What a wonderful idea. We\’ll definitely check it out on our next trip to NYC. Nice to see some Chicago suburbs on the list. I\’m guessing this will only continue to grow. Very cool! Hope your charge holds up! 🙂 but if you need it, it will be waiting!